"Mart of Darkness" was the ninth episode of the fourth season of the Daria TV series (episode number 409). It first aired on MTV on July 5th, 2000. This episode was written by Rachelle Romberg. Payday, a new "big box" warehouse store, opens in Lawndale. Various characters are drawn to it:Jane needs a new supply of Gummi Bears for her sculpture because Tom inadvertently chowed down on her supply; Daria needs a new bootlace because Quinn stole hers to replace the purse string she broke; Kevin and Brittany need to get barbeque sauce for the Lawndale High cookout being held at the Thompson house; the Fashion Club needs sunscreen; and Trent and Jesse just happen to be going there, with Tom tagging along and hoping for the opportunity to make amends with Jane. A long and degrading search for items takes place, but not quite as degrading as Mr. DeMartino battling Mrs. Johannsen for free junk food samples. Back at the barbeque, Mr. O'Neill (at Ms. Li's urging) tries talking to Mr. Thompson about Kevin's grades, but all Mr. Thompson is interested in doing is pressuring Mr. O'Neill into passing Kevin along, bad grades or no. Things eventually deteriorate into a brawl when Ms. Barch comes to Mr. O'Neill's defense after Mr. Thompson tries to rough him up. 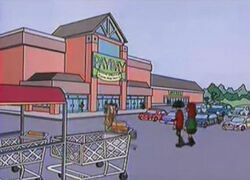 At Payday, Daria and Jane find the items they need and unexpectedly run into Andrea, whose parents made her take a job there as a stock clerk. (She expects Daria and Jane to cut her down "like they always do" but they reassure Andrea that "they never saw her", which elevates them a notch or two in her eyes.) Tom doesn't find Jane, but he does get driven to distraction by Trent's and Jesse's much-too-laid-back attitudes. The whole sordid affair is topped off by a power outage caused by Mr. DeMartino's struggle with a security guard over the free food, causing everyone to be trapped in the store until power can be restored. A key moment is Andrea's reaction to Daria and Jane. After spending the whole episode avoiding them, she lashes out: "Now you can make fun of the pathetic goth chick whose parents make her work at a crappy job in a stupid warehouse store. Go on, cut me up like you do everyone else." While it's clear Andrea is projecting her resentment towards the job onto them, her "cut me up" jab might reflect the attitude that Daria and Jane's fellow students in general have toward them - namely that they expect the pair to cruelly insult and humiliate anyone who crosses their path. This, along with Lucky Strike, is one of only two episodes that does not contain an appearance by Helen and Jake. The title is derived from the novella Heart of Darkness by Joseph Conrad. Tom and Trent actually interact here, and for more than just a few words! Trent seems cool with Tom, but his lazy ways and time-wasting at Payday drive Tom to frustration and despair. We meet Kevin's parents Doug and Charlene, who first appeared in the 1998 book "The Daria Database": the episode uses their look, their age, and Charlene's issues with Brittany. "Database" was written by this season's story editor, Peggy Nicoll.